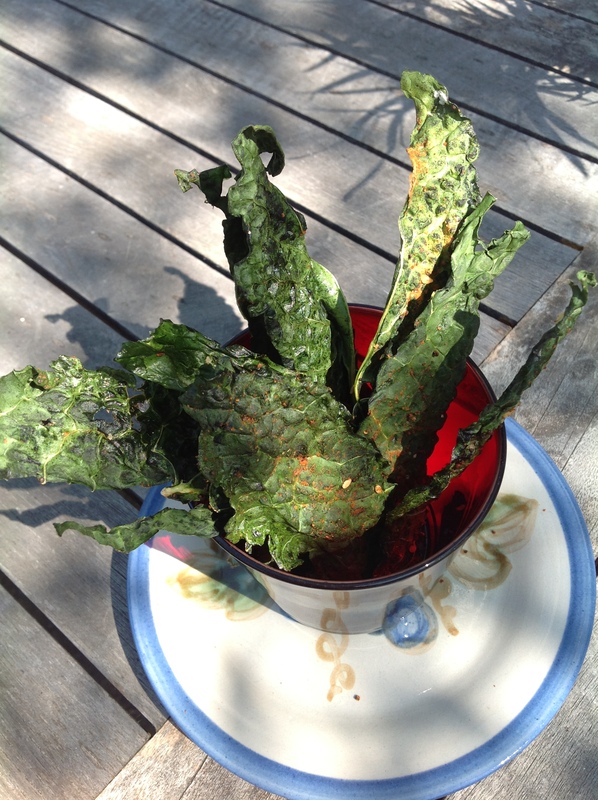 Our friends Sheri and Mo made, and thankfully shared with us, the most amazing spicy kale chips. 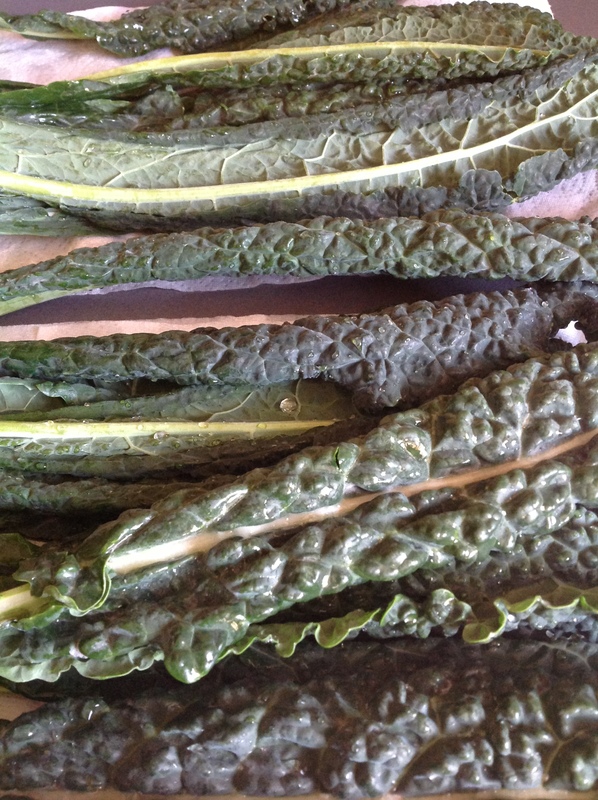 We’re converted from kale whiners–“too tough, too difficult to prep, yada, yada, ya”–to kale believers! The recipe does take a bit of time, so relax and enjoy the process, or make the chips with a friend for some together time. Served in colorful glass with a cocktail, these are a beautiful and healthy apertif. Listen: Both while you’re creating and enjoying these, I recommend the sassy swing of The Mavericks. If you’re not familiar with them, you may want to try their 2004 Definitive Collection. From the twangy, country refrains of “There Goes My Heart,” to their cool and soulful version of “Blue Moon,” and the brassy Latino horns in “Dance the Night Away,” you’ll be dancing and singing. Sip: Squeeze some fresh grapefruit and orange juice, mix and then serve on the rocks in a salt- and cumin-rimmed glass. If you want a kick, add some good tequila. Heat the oven to 250 degrees while you prep the kale. 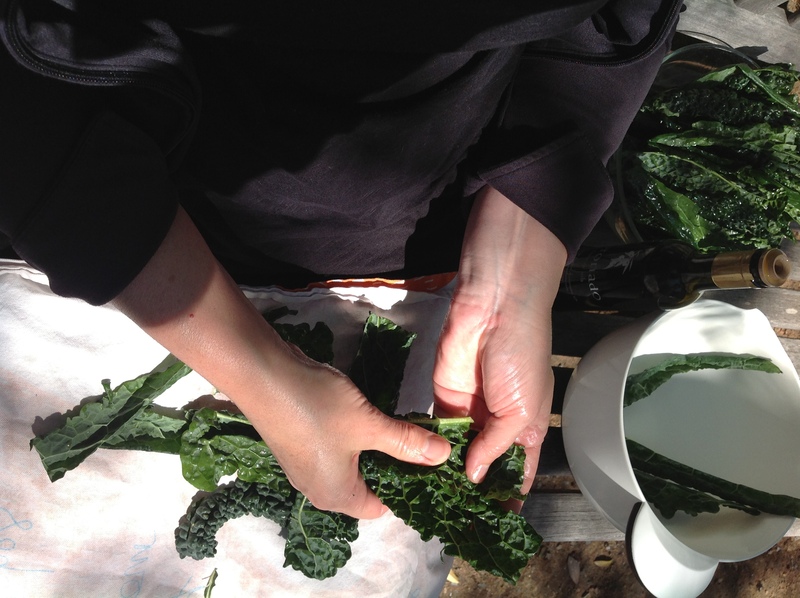 Wash, dry, stem, and cut the kale. 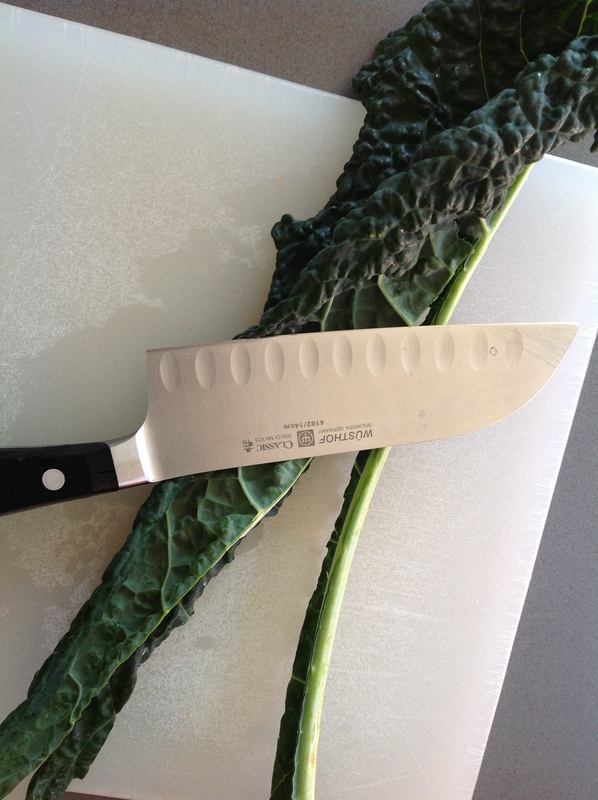 I find it easy to remove the rib if I fold each kale leaf in half and cut the rib out with the tip of a sharp knife. 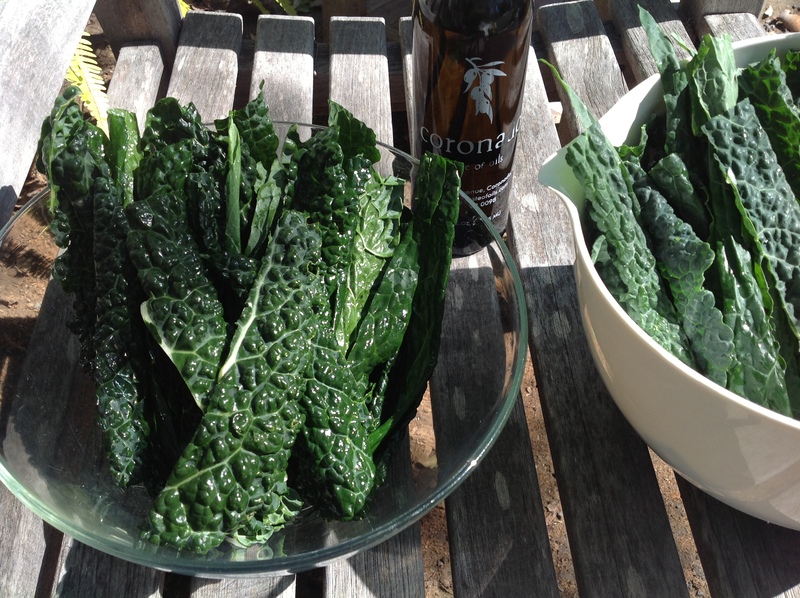 I cut the Lacinato (“Dinosaur”) Kale in spear-shaped chips in order to serve them in a glass. Create an oiling set-up. I used two bowls and a towel. Pour some favorite olive oil, spiced or flavored if you wish, into your hands and massage each leaf until oil lightly coats it. We particularly like Coronado Taste of Oils Chipotle Oil. Spread the leaves on cookie sheets or grill sheets so that they do not overlap and sprinkle them with seasonings of your choice. On half of my recent batch I used Penzeys Salad Elegant Seasoning and kosher sea salt; on the other half I used Tajin (a bright, citrusy Mexican seasoning) and kosher sea salt. 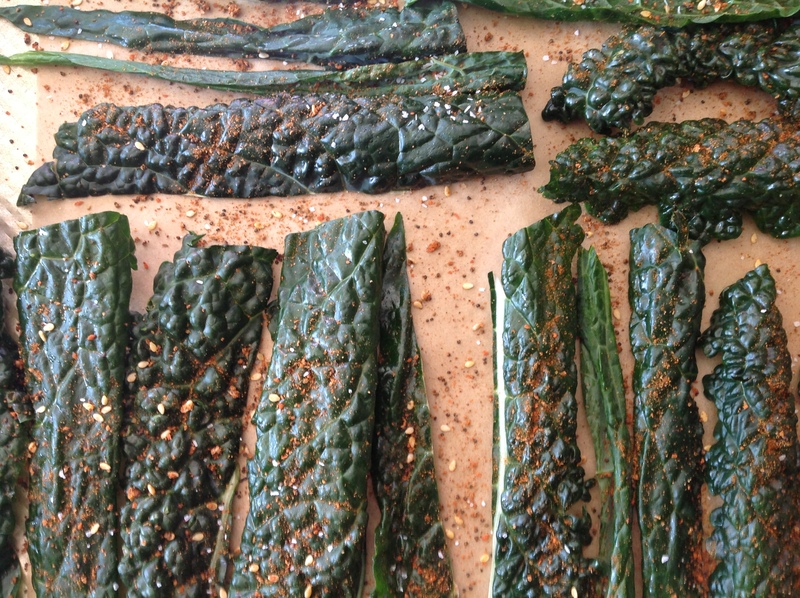 Bake the kale chips for approximately 30 minutes, turning the leaves at 15 minutes. I also switched the tray positions at 15 minutes. 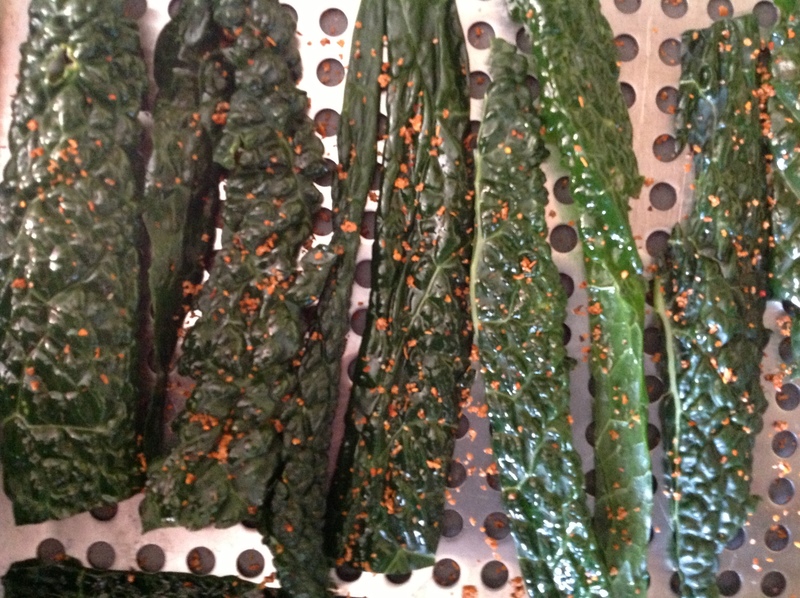 The grill sheet that had holes in it crisped the kale more quickly, for a total cooking time of 20 minutes. I LOVE kale. It’s been a recent obsession of mine, and I can’t stop eating it! I put it in my smoothies every morning! Looks great Ms. McKinstry!